The race is on to produce longer-range, precision-guided missiles that can more accurately identify and hone in on targets. Anew generation of air-to-ground weapons are under development and entering operational service. They are characterised by their small size and high accuracy, features which are likely to reduce collateral damage in the target area and allow the weapon to be carried in the internal weapon bays of low-observable fighters such as the Lockheed Martin F-35, the Sukhoi T-50 PAK FA, Chengdu J-20 stealth fighter jet and the Shenyang J-31 fifth-generation jet fighter. Most of these weapons use multi-mode guidance. The classic weapon of this type is Raytheon's GBU-53/B Small Diameter Bomb II (SDB II). Ordered into low-rate initial production in June 2015, it is small enough to allow eight to be carried in the weapons bay of the F-35 Lightning II. During the initial stages of flight, this glide weapon flies under integrated INS/GPS guidance. Shortly after initial release and wing deployment, GPS and Link 16 initiation will begin, followed by seeker activation. A two-way datalink operates in Link 16 and UHF modes. This sends target position updates and targeting/abort commands to the weapon, allows third party targeting and provides weapon-status data (such as own location and time remaining until impact) back to the launch aircraft. The tri-mode seeker combines millimetre-wave (MMW) radar, uncooled imaging infrared (IIR) and semi-active laser (SAL) sensors. The target area is initially searched using the MMW radar, which is able to detect and track stationary or moving targets, even in adverse weather conditions. Its data can be fused with the output of the IIR sensor to provide target classification and to allow identification of the optimum aim point. If a laser–illuminated (SAL) attack is to be carried out, the weapon can be programmed to approach the target from a specific azimuth and impact angle, while updated target position information received via the data link can be used to preposition the sensor before beginning a search for the reflected laser energy. The range of the GBU-53/B will depend on release height. When released at high altitude, it is expected to have a range of at least 74 km. For short-range targets, an immediate-attack mode is used, in which the weapon manoeuvres sharply after release in order to adopt the optimum attack path. 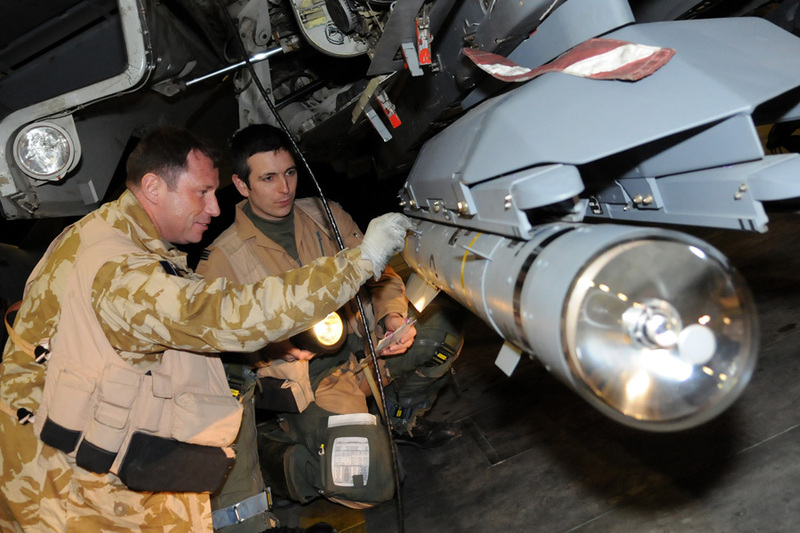 Raytheon promoted the GBU-53/B as a potential 'off-the-shelf' solution to the UK's Select Precision Effects At Range (SPEAR) Cap 3 requirement, one of five envisaged guided weapon capabilities. Capability 1 (Cap 1) was achieved by the procurement of the Raytheon Paveway IV, while Cap 2 would be met by an advanced version of Brimstone. Cap 3 called for a small guided weapon able to engage tactical targets from a safe standoff range. Cap 4 was provided by the MBDA Storm Shadow cruise missile, and Cap 5 covered a future cruise/anti-ship weapon. In practice, the range desired by the UK for SPEAR Cap 3 required a powered weapon—virtually a miniature cruise missile. Raytheon studied a possible powered version of its SDB II, but the UK rejected this in favour of an all-new design proposed by MBDA. Now being marketed under the designation 'SPEAR', the new design is intended to allow attacks to be made against mobile, fleeting and re-locatable targets on land or at sea, while allowing the aircraft to remain at a safe stand-off range from enemy air defences. Its seeker is based on that of the Brimstone 2, using MMW and SAL terminal guidance modes to allow all-weather day and night attacks despite the use of enemy defensive techniques such as countermeasures, obscurants and camouflage. The weapon is powered by a Pratt & Whitney TJ-150 turbojet engine in the 150 lb (670 Newton) thrust class. This adds to the complexity and cost, but gives a longer range than would be possible with an unpowered glide bomb, a reduced time of flight and allows the missile to be released at a wider range of altitudes and headings. It also allows more freedom when mission planning, making it easier for the final attack to be made from a range of approach directions. An airframe and propulsion flight test demonstration was performed in March 2016, with a prototype weapon successfully deployed from a Typhoon aircraft. The Eurofighter Typhoon will be used as the trials platform for the development programme. The required integration would allow the weapon to be carried operationally on Typhoon should the UK opt to do this. A £411 million (US$597 million) contract from the UK Ministry of Defence (MoD) is funding a four-year development phase to prepare the weapon for integration within the internal weapons bay of the F-35B Joint Strike Fighter. A Main Gate review is due to take place in 2018. If successful, this should allow the weapon to enter service in 2025. 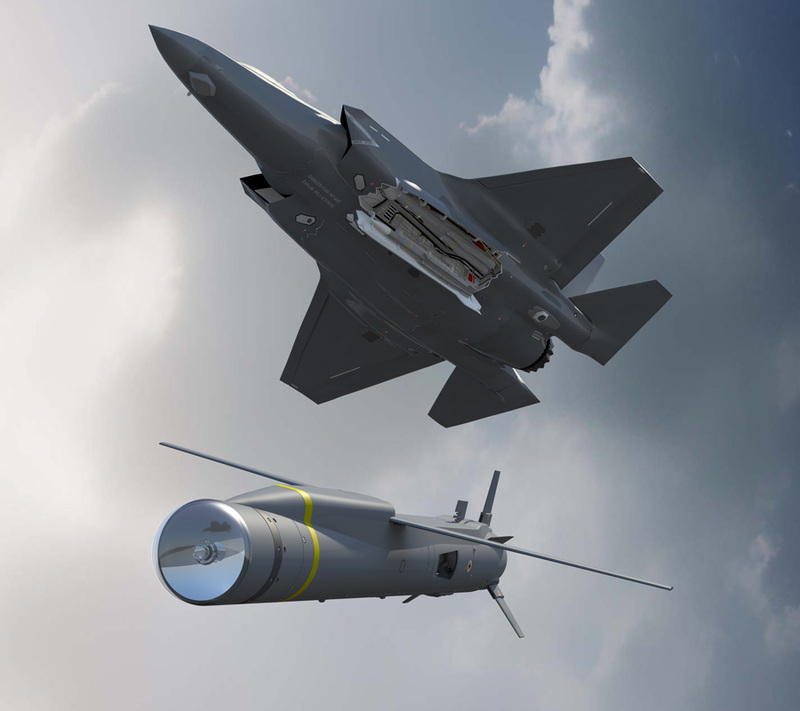 The SPEAR Cap 2 requirement for a shorter-ranged missile is being met by MBDA's Brimstone 2. Developed by what was then Alenia Marconi Systems (now part of MBDA), the original version of Brimstone had carried an active MMW type, but from 2007 to 2008 MBDA created the Dual-Mode Brimstone (DMB) by remanufacturing existing Brimstone missiles to add a SAL guidance mode to the seeker. Used to engage static targets with minimal radar cross section, SAL guidance is combined with MMW radar guidance when the missile is fired against fast-moving targets in cluttered environments. Brimstone 2 entered service with the Royal Air Force in May 2016. It is based on the DMB, but maximum range and off-boresight capability are more than doubled, increased manoeuvrability allows release from fast moving and manoeuvring platforms and increased end-game performance against highly dynamic targets, while the guidance has been improved in order to cope with targets of significantly lower reflectivity and highly cluttered environments. Its new rocket motor and warhead are intended to meet insensitive-munitions requirements, a feature that will allow its use aboard aircraft carriers. Brimstone 2 will initially be carried by the Tornado GR4, but is due to be carried by the Typhoon, Reaper and Boeing AH-64E. 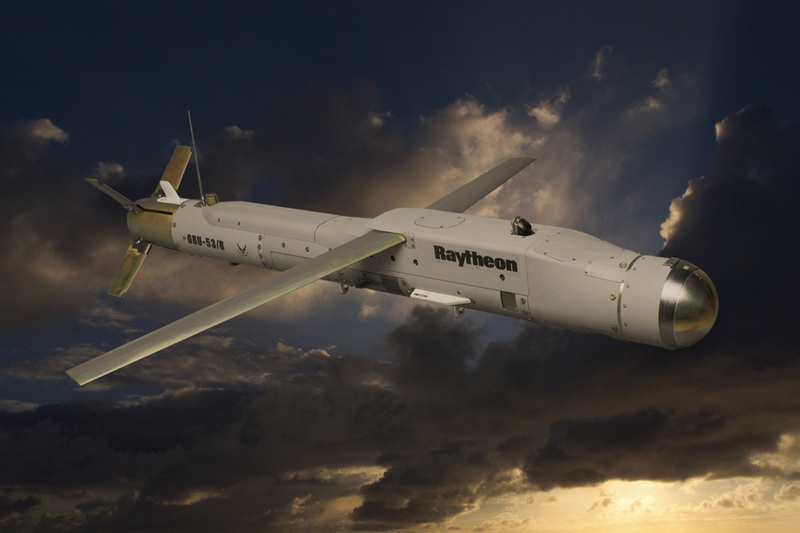 Rafael's Spice 250 glide bomb is being marketed as an alternative to the GBU-53/B and can be mounted either directly on the aircraft’s store stations or on a Smart Quad Rack. A standoff range of 100 km allows it to be released outside the range of most air defences. As the weapon approaches the target, imagery from a nose-mounted seeker operating in imaging IR and CCD modes is compared with reference data stored in its computer memory. Once the target has been acquired, Spice 250 homes autonomously, making its final approach from a pre-programmed direction and impact angle. Circular error probable is reported to be less than 3 m.
A datalink allows post-release updating of the impact point when engaging moving or time-sensitive targets. Imagery taken in the final moments of the weapon's approach to the target can be sent back to the launch aircraft, where it can be reviewed by the pilot or stored. At the 2015 MAKS air show, Russia's Tactical Missiles Corporation showed four new air-to-surface weapons whose length and configuration will allow internal carriage in the PAK FA's weapons bays. However, none have multimode seeker of the type used by weapons such as GBU-53/B and SPEAR. 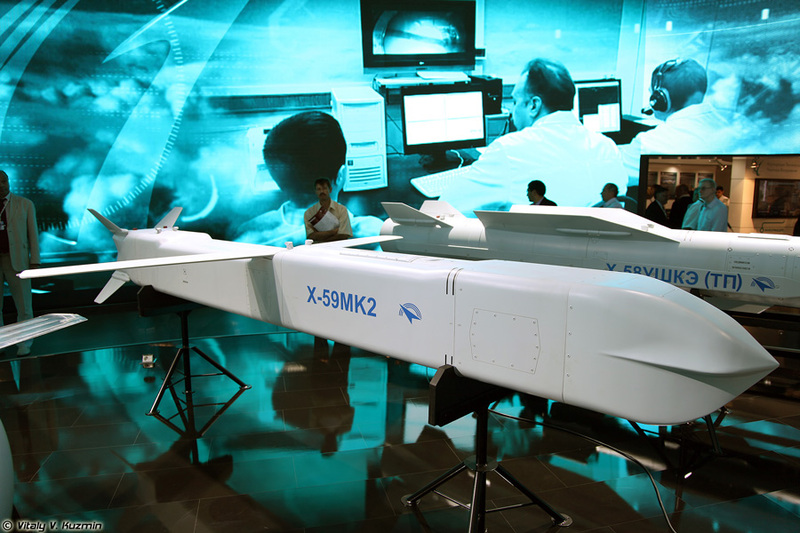 Although it retains a designation based on that of existing Kh-59 series weapons, the Raduga Kh-59MK2 guided cruise missile introduces a fuselage of rectangular 40 x 40 cm configuration, fitted with folding wings of 2.45 m span and powered by a turbojet sustainer whose air intake is positioned on the lower surface of the fuselage. A combination of inertial and satellite navigation is used for mid-course guidance, followed by either an OE-M daytime optical terminal guidance system or a thermal-imaging equivalent designated TP-DK. A 310 kg penetrator warhead or submunition payload can be delivered with a CEP of 5 m (daytime optical) or 3 m (thermal) homing. The maximum range is around 300 km. Raduga's new Kh-58UShKE (TP) anti-radiation missile is based on the earlier Kh-58UShKE, and retains the latter's combination of inertial mid-course guidance and passive radar homing. However, it also incorporates a thermal-imaging terminal guidance channel that will allow attacks to be made against targets that cease emitting RF energy. The missile weighs 650 kg at launch, and can deliver a 149 kg HE warhead over ranges of 10 km to 245 km. Currently in the final stages of development and flight testing, the Kh-58UShKE (TP) is expected to enter production in 2017. Grom-E1 and Grom-E2 are derivatives of the Kh-38MLE air-to-surface missile. Both of these Tactical Missile Corporation glide bombs are relatively simple weapons that rely on a strap down inertial navigation system that allows in-flight navigation satellite updates. No seeker is fitted. Grom-El is powered by a solid-propellant rocket motor and carries a 250 kg warhead, while the -E2 is an unpowered glide bomb that carries a second warhead (weighing 130 kg) instead of a rocket motor. While both were probably designed for use by the PAK FA, they can be carried by other aircraft. At MAKS 2015, Grom-E2 was displayed on an underwing pylon of the MiG-29M (MiG-35) fighter. 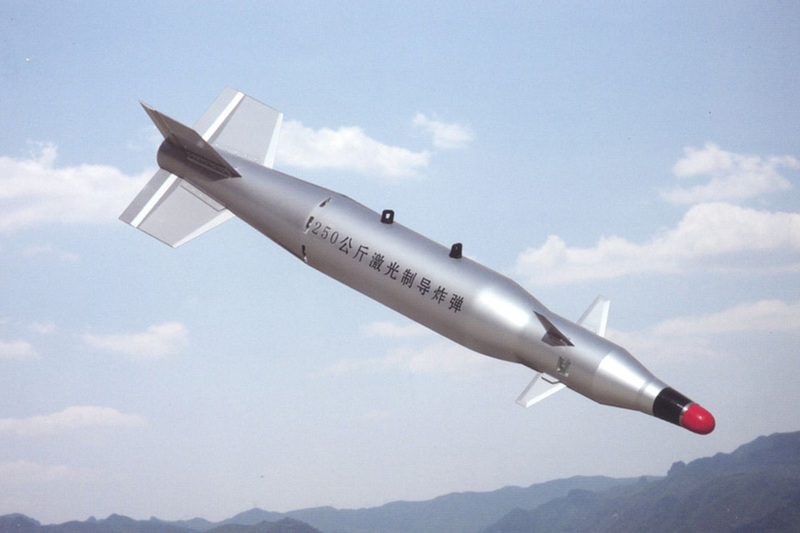 Although China offers several small, smart air-to-surface weapons, these are similar in concept to the US Laser Joint Direct Attack Munition, combining satnav-aided and inertial navigation with SAL seekers. None have multi-mode seekers. NORINCO's 270 kg GB3 is about 3 m long, has a maximum diameter of 299 mm and weighs 270 kg. CEP is less than 15 m when used in GPS/INS mode, falling to less than 3 m when the SAL seeker is used. The maximum range is 20 km. Luoyang Optoelectro Technology Development Center's LT-3 is 3.58 m long and 380 mm in diameter. It can deliver a 500 kg warhead with a claimed CEP of 3 m. Other small weapons using this combination of guidance include the 50 kg and 100 kg variants of Luoyang's LS-6 series. Following an earlier career in engineering, Doug Richardson has worked as a defence journalist specialising in topics such as aircraft, missiles and military electronics. He is the author of more than 20 books on various defence topics. From 1998 to 2013 he was the editor of the monthly title Jane's Missiles & Rockets. He also writes for Defence Procurement International.